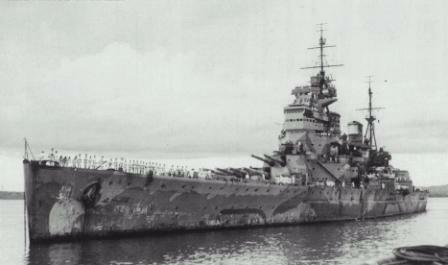 HMS Prince of Wales and HMS Repulse had arrived in Singapore on the 2nd of December 1941. After receiving news of a Japanese convoy heading towards Malaya, the Prince of Wales, Repulse, and four destroyers Electra, Express, Vampire and Tenedos, sailed from Singapore at 17.10 on 8th December. Churchill had publicly announced that the Prince of Wales and Repulse were being sent to Singapore. Admiral Yamamoto then reinforced his Air Groups with 36 ‘Betty’ Bombers to add to the existing aircraft and began training the force to attack the two capital ships when they arrived. They were spotted by Japanese submarine I-65 on 9 December, which shadowed the British ships, reporting their positions. At around 11.40, 17 ‘Nell’ torpedo bombers approached the two capital ships. This first wave of torpedo attackers only managed one hit, on Prince of Wales where her outer port propeller shaft exited the hull, bending the shaft and causing a massive water leak. It also caused a loss of power to many of the turrets. The Prince of Wales and the Repulse were still about two miles apart. Prince of Wales could only manage 15 knots but could not steer and had a huge list to port. At that point Japanese aircraft were sighted, 26 ‘Betty’ bombers carrying torpedoes. Six aircraft attacked the Prince of Wales scoring 4 hits she now slowed to 8 knots and had taken on 18,000 tons of water. 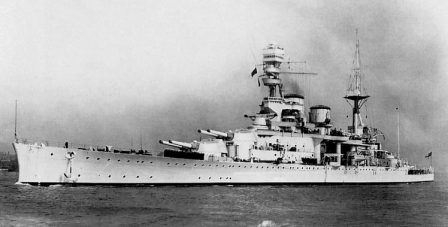 Repulse was then attacked, 8 torpedoes at her starboard side and 3 at her port side.Captain Tennant managed to avoid all but one of 11 torpedoes aimed at her. Then came a second attack by 9 ‘Bettys’ and Repulse was hit by 4 more torpedoes Repulse listed heavily to port over a period of about six minutes and finally rolled over and sank at 12.33. 27 Officers and 486 Ratings were lost. At 12.41 Prince of Wale’s lookouts spotted 8 bombers approaching. She was struck by one of the 500kg bombs which exploded causing heavy casualties.HMS Express came alongside to take off survivors. At 13.15 the list to port suddenly started to increase. The order to abandon ship was then given and soon after Prince of Wales rolled over to port and sank with the loss of 20 Officers and 307 Ratings.